Turquoise is an opaque, blue-to-green mineral that is a hydrous phosphate of copper and aluminum, with the chemical formula CuAl6(PO4)4(OH)8•4H2O. It is rare and valuable in finer grades and has been prized as a gem and ornamental stone for thousands of years because of its unique hue. Like most other opaque gems, turquoise has been devalued in recent years by the introduction of treatments, imitations, and synthetics onto the market, some difficult to detect even by experts. The substance has been known by many names, but the word turquoise was derived sometime during the sixteenth century from the French language, either from the word for Turkish (Turquois) or dark-blue stone (pierre turquin). This may have arisen from a misconception: turquoise does not occur in Turkey but was traded at Turkish bazaars to Venetian merchants who brought it to Europe. The color, however, has been employed extensively in the decorative tiles adorning Turkish places of worship and homes for hundreds of years, beginning with the Seljuks, and the association quite possibly caused the name to take root. For at least two thousand years, the region once known as Persia has remained the most important source of turquoise, for it is here that fine material is most consistently recovered. This "perfect color" deposit that is blue naturally and turns green when heated is limited to a mine in Neyshabur, Iran. 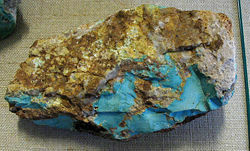 Iranian turquoise is often found replacing feldspar. Although it is commonly marred by whitish patches; its color and hardness are considered superior to the production of other localities. Iranian turquoise has been mined and traded abroad for centuries, and was probably the source of the first material to reach Europe. Since at least the First Dynasty (3000 B.C.E.) and possibly before, turquoise was used by the Egyptians and was mined by them in the Sinai Peninsula, called "Country of Turquoise" by the native Monitu. There are six mines in the region, all on the southwest coast of the peninsula, covering an area of some 650 square kilometers. The two most important of these mines from an historical perspective are Serabit el-Khadim and Wadi Maghareh, believed to be among the oldest of known mines. The former mine is situated about four kilometers from an ancient temple dedicated to Hathor. The turquoise is found in sandstone that was originally overlain by basalt. Copper and iron workings are present in the area. Large-scale turquoise mining is not profitable today, but the deposits are sporadically quarried by Bedouin peoples using homemade gunpowder. In the rainy winter months, miners face a risk from flash flooding; even in the dry season, death from the collapse of the haphazardly exploited sandstone mine walls is not unheard of. The color of Sinai material is typically greener than Iranian material, but is thought to be stable and fairly durable. Often referred to as Egyptian turquoise, Sinai material is typically the most translucent, and under magnification its surface structure is revealed to be peppered with dark blue discs not seen in material from other localities. In proximity to nearby Eilat, Israel, an attractive intergrowth of turquoise, malachite, and chrysocolla is found. This rock is called Eilat stone and is often referred to as Israel's national stone. It is worked by local artisans for sale to tourists. The Southwest [[United States is a significant source of turquoise; Arizona, California, Colorado, New Mexico and Nevada are (or were) especially rich. The deposits of California and New Mexico were mined by pre-Columbian Native Americans using stone tools, some local and some from as far away as central Mexico. Cerrillos, New Mexico is thought to be the location of the oldest mines; prior to the 1920s, the state was the country's largest producer; it is more or less exhausted today. Only one mine in California, located at Apache Canyon, operates at a commercial capacity today. The turquoise occurs as vein or seam fillings, and as compact nuggets; these are mostly small in size. 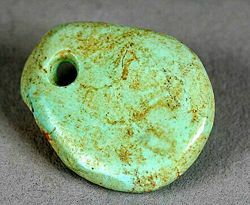 While quite fine material—rivalling Iranian material in both color and durability—is sometimes found, most American turquoise is of a low grade (called "chalk turquoise"); high iron levels mean greens and yellows predominate, and a typically friable consistency precludes use in jewelry in the turquoise's untreated state. Arizona is currently the most important producer of turquoise by value, with the vivid Bisbee Blue being a good example of the state's natural endowment; much of the Arizona material is recovered as a byproduct of copper mining. Nevada is the country's other major producer, with more than 120 mines which have yielded significant quantities of turquoise. Unlike elsewhere in the U.S., most Nevada mines have been worked primarily for their gem turquoise and very little has been recovered as a byproduct of other mining operations. Nevada turquoise is found as nuggets, fracture fillings and in breccias as the cement filling interstices between fragments. Because of the geology of the Nevada deposits, a majority of the material produced is hard and dense, being of sufficient quality that no treatment or enhancement is required. Nevada has produced a wide diversity of colors and mixes of different matrix patterns, with turquoise from Nevada coming in various shades of blue, blue-green, and green. Nevada produces some unique shades of bright mint to apple to neon yellow green. 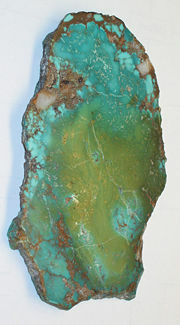 Some of this unusually colored turquoise may contain significant zinc and iron, which is the cause of the beautiful bright green to yellow-green shades. Some of the green to green yellow shades may actually be Variscite or Faustite, which are secondary phosphate minerals similar in appearance to turquoise. A significant portion of the Nevada material is also noted for its often attractive brown or black limonite veining, producing what is called "spiderweb matrix." While a number of the Nevada deposits were first worked by Native Americans, the total Nevada turquoise production since the 1870s has been an estimated at more than six hundred tons, including nearly four hundred tons from the Carico Lake mine. In spite of increased costs, small scale mining operations continue at a number of turquoise properties in Nevada, including the Godber, Orvil Jack and Carico Lake Mines in Lander County, the Pilot Mountain Mine in Mineral County, and several properties in the Royston and Candelaria areas of Esmerelda County. Untreated turquoise from Nevada, United States. In 1912, the first deposit of distinct, single-crystal turquoise was discovered Virginia. The crystals, forming a druse over the mother rock, are very small—1 millimeter (0.04 inches) is considered large. Until the 1980s, Virginia was widely thought to be the only source of distinct crystals. There are now at least 27 other localities. The specimens are highly valued by collectors. 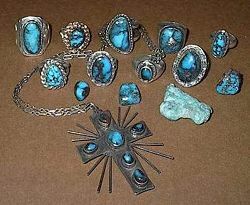 In an attempt to recoup profits and meet demand, some samples of American turquoise are treated or "enhanced" to some extent. These treatments include innocuous waxing and more controversial procedures, such as dyeing and impregnation (see Treatments). Some American mines, however, produce materials of high enough quality that no treatment or alterations are required. Any such treatments that have been performed should be disclosed to the buyer on sale of the material. China has been a minor source of turquoise for three thousand years or more. Gem-quality material, in the form of compact nodules, is found in the fractured, silicified limestone of Yunxian and Zhushan, Hubei province. Additionally, Marco Polo reported turquoise found in present-day Sichuan. Most Chinese material is exported, but there are some carvings worked in a manner similar to jade. In Tibet, where green turquoise has long been appreciated, gem-quality deposits purportedly exist in the mountains of Derge and Nagari-Khorsum, to the east and west of the region, respectively. However, the existence of these deposits needs to be corroborated. Other notable localities include Afghanistan, Australia, northern Chile, Cornwall, Saxony, Silesia, and Turkestan. The pastel shades of turquoise have endeared it to many great cultures of antiquity: it has adorned the rulers of Ancient Egypt, the Aztecs (and possibly other pre-Columbian Mesoamericans), Persia, Mesopotamia, the Indus Valley, and to some extent in ancient China since at least the Shang Dynasty. Despite being one of the oldest gems, probably first introduced to Europe (through Turkey) with other Silk Road novelties, turquoise did not become important as an ornamental stone in the West until the fourteenth century, following a decline in the Roman Catholic Church's influence, which allowed the use of turquoise in secular jewelry. It was apparently unknown in India until the Mughal period, and unknown in Japan until the eighteenth century. A common belief shared by many of these civilizations held that turquoise possessed certain prophylactic qualities; it was thought to change color with the wearer's health and protect him or her from untoward forces. The Aztecs inlaid turquoise, together with gold, quartz, malachite, jet, jade, coral, and shells, into provocative (and presumably ceremonial) mosaic objects such as masks (some with a human skull as their base), knives, and shields. Natural resins, bitumen and wax were used to bond the turquoise to the objects' base material; this was usually wood, but bone and shell were also used. Like the Aztecs, the Pueblo, Navajo and Apache tribes cherished turquoise for its amuletic use; the latter tribe believe the stone to afford the archer dead aim. Among these peoples turquoise was used in mosaic inlay, in sculptural works, and was fashioned into toroidal beads and freeform pendants. The Ancient Pueblo Peoples (Anasazi) of Chaco Canyon and surrounding region are believed to have prospered greatly from their production and trading of turquoise objects. The distinctive silver jewelry produced by the Navajo and other Southwestern Native American tribes today is a rather modern development, thought to date from around 1880 as a result of European influences. 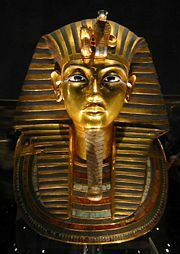 The Egyptian use of turquoise stretches back as far as the First Dynasty and possibly earlier; however, probably the most well-known pieces incorporating the gem are those recovered from Tutankhamun's tomb, most notably the pharaoh's iconic burial mask which was liberally inlaid with the stone. It also adorned rings and great sweeping necklaces called pectorals. Set in gold, the gem was fashioned into beads, used as inlay, and often carved in a scarab motif, accompanied by carnelian, lapis lazuli, and in later pieces, colored glass. Turquoise, associated with the goddess Hathor, was so liked by the ancient Egyptians that it became (arguably) the first gemstone to be imitated, the fair semblance created by an artificial glazed ceramic product known as faience. A similar blue ceramic has been recovered from Bronze Age burial sites in the British Isles. The French conducted archaeological excavations of Egypt from the mid-nineteenth through the early twentieth century. These excavations, including that of Tutankhamun's tomb, created great public interest in the western world, subsequently influencing jewelry, architecture, and art of the time. Turquoise, already favoured for its pastel shades since around 1810, was a staple of Egyptian Revival pieces. In contemporary Western use, turquoise is most often encountered cut en cabochon in silver rings, bracelets, often in the Native American style, or as tumbled or roughly hewn beads in chunky necklaces. Lesser material may be carved into fetishes, such as those crafted by the Zuni. While strong sky blues remain superior in value, mottled green and yellowish material is popular with artisans. In Western culture, turquoise is also the traditional birthstone for those born in the month of December. Turquoise may have significance in Judeo-Christian scripture: In the Book of Exodus, the construction of a "breastplate of judgment" is described as part of the priestly vestments of Aaron (Exodus 28:15-30). Attached to the ephod, the breastplate was adorned with twelve gemstones set in gold and arranged in four rows, each stone engraved with the name of one of the Twelve Tribes of Israel. Of the four stones in the third row, the first and second have been translated to be turquoise by various scholars; but others disagree, translating the stones to be jacinth (zircon) and agate, respectively. Scholars also disagree as to which tribes each stone is meant to represent. As a secondary mineral, turquoise apparently forms by the action of percolating acidic aqueous solutions during the weathering and oxidation of pre-existing minerals. For example, the copper may come from primary copper sulfides such as chalcopyrite or from the secondary carbonates malachite or azurite; the aluminum may derive from feldspar; and the phosphorus from apatite. Climate factors appear to play an important role as turquoise is typically found in arid regions, filling or encrusting cavities and fractures in typically highly altered volcanic rocks, often with associated limonite and other iron oxides. In the American southwest, turquoise is almost invariably associated with the weathering products of copper sulfide deposits in or around potassium feldspar bearing porphyritic intrusives. In some occurrences alunite, potassium aluminum sulfate, is a prominent secondary mineral. Typically turquoise mineralization is restricted to a relatively shallow depth of less than 20 meters, although it does occur along deeper fracture zones where secondary solutions have greater penetration or the depth to the water table is greater. Although the features of turquoise occurrences are consistent with a secondary or supergene origin, some sources refer to a hypogene origin. The hypogene hypothesis, which holds that the aqueous solutions originate at significant depth, from hydrothermal processes. Initially at high temperature, these solutions rise upward to surface layers, interacting with and leaching essential elements from pre-existing minerals in the process. As the solutions cool, turquoise precipitates, lining cavities and fractures within the surrounding rock. This hypogene process is applicable to the original copper sulfide deposition; however, it is difficult to account for the many features of turquoise occurrences by a hypogene process. That said, there are reports of two-phase fluid inclusions within turquoise grains that give elevated homogenization temperatures of 90 to 190 °C that require explanation. Even the finest of turquoise is fracturable, reaching a maximum Mohs hardness of just under 6, or slightly more than window glass. Characteristically, a cryptocrystalline mineral, turquoise almost never forms single crystals and all of its properties are highly variable. Its crystal system is proven to be triclinic via X-ray X-ray diffraction|diffraction]] testing. With lower hardness comes lower specific gravity (high 2.90, low 2.60) and greater porosity: These properties are dependent on grain size. The luster of turquoise is typically waxy to subvitreous, and transparency is usually opaque, but may be semitranslucent in thin sections. Color is as variable as the mineral's other properties, ranging from white to a powder blue to a sky blue, and from a blue-green to a yellowish green. The blue is attributed to idiochromatic copper while the green may be the result of either iron impurities (replacing aluminum) or dehydration. The refractive index (as measured by sodium light, 589.3 nanometers) of turquoise is approximately 1.61 or 1.62; this is a mean value seen as a single reading on a gemmological refractometer, owing to the almost invariably polycrystalline nature of turquoise. A reading of 1.61–1.65 (birefringence 0.040, biaxial positive) has been taken from rare single crystals. An absorption spectrum may also be obtained with a hand-held spectroscope, revealing a line at 432 nanometers and a weak band at 460 nanometers (this is best seen with strong reflected light). Under longwave ultraviolet light, turquoise may occasionally fluoresce green, yellow or bright blue; it is inert under shortwave ultraviolet and X-rays. Turquoise is infusible in all but heated hydrochloric acid. Its streak is a pale bluish white and its fracture is conchoidal, leaving a waxy luster. Despite its low hardness relative to other gems, turquoise takes a good polish. Turquoise may also be peppered with flecks of pyrite or interspersed with dark, spidery limonite veining. The Egyptians were first to produce an artificial imitation of turquoise, in the glazed earthenware product faience. Later glass and enamel were also used, and in modern times more sophisticated ceramics, porcelain, plastics, and various assembled, pressed, bonded, and sintered products (composed of various copper and aluminum compounds) have been developed: examples of the latter include "Viennese turquoise," made from precipitated aluminum phosphate colored by copper oleate; and "neolith," a mixture of bayerite and copper phosphate. Most of these products differ markedly from natural turquoise in both physical and chemical properties, but in 1972 Pierre Gilson introduced one fairly close to a true synthetic (it does differ in chemical composition owing to a binder used, meaning it is best described as a simulant rather than a synthetic). Gilson turquoise is made in both a uniform color and with black "spiderweb matrix" veining, not unlike the natural Nevada material. The most common imitation of turquoise encountered today is dyed howlite and magnesite, both white in their natural states, and the former also having natural (and convincing) black veining similar to that of turquoise. Dyed chalcedony, jasper, and marble is less common, and much less convincing. Other natural materials occasionally confused with or used in lieu of turquoise include: variscite; faustite; chrysocolla (especially when impregnating quartz); lazulite; smithsonite; hemimorphite; wardite; and a fossil bone or tooth called odontolite or "bone turquoise," colored blue naturally by the mineral vivianite. Although rarely encountered today, odontolite was once mined in large quantities—specifically for its use as a substitute for turquoise—in southern France. Some destructive tests may, however, be necessary; for example, the application of diluted hydrochloric acid will cause the carbonates odontolite and magnesite to effervesce and howlite to turn green, while a heated probe may give rise to the acrid smell so indicative of plastic. Differences in specific gravity, refractive index, light absorption (as evident in a material's absorption spectrum), and other physical and optical properties are also considered as means of separation. Imitation turquoise is so prevalent that it likely outnumbers real turquoise by a wide margin. Even material used in authentic Native American and Tibetan jewelry is often fake or, at best, heavily treated. Turquoise is treated to enhance both its color and durability (i.e., increased hardness and decreased porosity). Historically, light waxing and oiling were the first treatments to be used (since ancient times), providing a wetting effect (thereby enhancing the color and luster); this treatment is more or less acceptable by tradition, and because such material is usually of a higher grade to begin with. Conversely, the later development of pressure impregnation of otherwise unsaleable chalky American material by epoxy and plastics (such as polystyrene) and water glass—also producing a wetting effect in addition to improving durability—are rejected by some as too radical an alteration. Plastic and water glass are technologically superior to oil and wax in that the former treatment are far more permanent and stable, and can be applied to material too friable for oil or wax to be of sufficient help; such material is termed "bonded" or "stabilized" turquoise. The epoxy binding technique was first developed in the 1950s and has been attributed to Colbaugh Processing of Arizona, a company that still operates today. The majority of American material is now treated in this manner; although it is a costly process requiring many months to complete; without impregnation most American mining operations would be unprofitable. Oiled and waxed stones are also prone to "sweating" under even gentle heat or if exposed to too much sun and they may develop a white surface film or bloom over time (with some skill, oil and wax treatments can be restored). Likewise, the use of Prussian blue and other dyes—often in conjunction with bonding treatments—to enhance (that is, make uniform or completely change) color is regarded as fraudulent by purists—especially since some dyes may fade or rub off on the wearer. Dyes have also been used to darken the veins of turquoise. Perhaps the most radical of treatments is "reconstitution," wherein supposedly fragments of fine material too small to be used singly are powdered and then bonded to form a solid mass. Much (if not all) of this "reconstituted" material is likely a complete fabrication (with no natural components), or may have foreign filler material added to it (see Imitations section). Another treatment—the details of which remain undisclosed—is the so-called Zachery process, named after its developer, electrical engineer and turquoise trader James E. Zachery. This process claims to use only medium grade material at a minimum, leaving the turquoise harder and with a better color and luster. As the finer turquoise is often found as thin seams, it may be glued to a base of stronger foreign material as a means of reinforcement. These are termed doublets and can be very deceptive in certain jewelry setting styles (such as closed back and bevel settings). 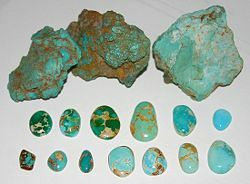 Some turquoise is cut with the mother rock serving as a base; these are usually not considered doublets but may have an intrinsic value lower than that of "whole" stones. Doublets, like the aforementioned treatments, are legal provided they are disclosed to the customer before sale. As is so often with gems, full disclosure is frequently not given; it is therefore left to gemologists to detect these treatments in suspect stones, using a variety of testing methods—some of which are necessarily destructive. For example, the use of a heated probe applied to an inconspicuous spot will reveal oil, wax, or plastic treatment with certainty. Richness of color is the chief determinant of the value of a turquoise sample. Generally speaking, the most desirable color is a strong sky blue to "robin's egg" blue (referring to the eggs of the American robin). The value decreases with the increase of green hue, lightening of color, and mottling. In Tibet, however, a greener blue is said to be preferred. Whatever the color, turquoise should not be excessively soft or chalky. Even if treated, such lesser material (to which most turquoise belongs) is liable to fade or discolor over time and will not hold up to normal use in jewelry. 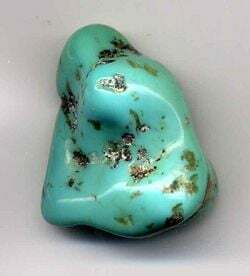 The mother rock or matrix in which turquoise is found can often be seen as splotches or a network of brown or black veins running through the stone in a netted pattern. This veining may add value to the stone if the result is complementary, but such a result is uncommon. Such material is sometimes described as "spiderweb matrix." It is most valued in the Southwest United States and Far East, but it is not highly appreciated in the Near East, where unblemished and vein-free material is ideal (regardless of how complementary the veining may be). Uniformity of color is desired, and in finished pieces the quality of workmanship is also a factor; this includes the quality of the polish and symmetry of the stone. Calibrated stones—that is, stones adhering to standard jewelry setting measurements—may also be more sought after. Like coral and other opaque gems, turquoise is commonly sold at a price according to its physical size in millimeters rather than weight. Turquoise is treated in many different ways, some more permanent and radical than others. Controversy exists as to whether some of these treatments should be acceptable, but one of these appears to be acceptable more or less universally—namely, the light waxing or oiling of gem turquoise to improve its color and luster. If the material is of high quality to begin with, very little of the wax or oil is absorbed, and the turquoise therefore does not "rely" on this impermanent treatment for its beauty. All other factors being equal, untreated turquoise will always command a higher price. Bonded and "reconstituted" material is worth considerably less. 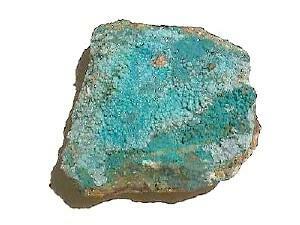 Being a phosphate mineral, turquoise is inherently fragile and sensitive to solvents. Perfume and other cosmetics will attack the finish and may alter the color of turquoise gems, as will skin oils and most commercial jewelry-cleaning fluids. Prolonged exposure to direct sunlight may also discolor or dehydrate turquoise. Care should therefore be taken when wearing such jewels: cosmetics, including sunscreen and hairspray, should be applied before putting on turquoise jewelry, and they should not be worn to a beach or other sun-bathed environment. 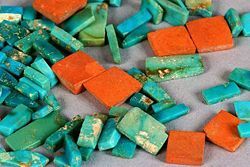 After use, turquoise should be gently cleaned with a soft cloth to avoid the buildup of residue, and should be stored in its own box to avoid scratching by harder gems. Also, the box should not be airtight, or the turquoise will become ruined. The word "turquoise" also refers to a slightly greenish shade of cyan. ↑ 1.0 1.1 R. J. King, "Turquoise," Geology Today 18 (3) (2002): 110-114. Retrieved July 9, 2007. ↑ Firoozeh-Iran.com, About Neyshabour (Center of persian turquoise in the world). Retrieved July 9, 2007. ↑ Minerals of Nevada, Nevada Bureau of Mines Special Pub. 31: 78-81, 443-445. ↑ Element 51. 2007. Turquoise Crystal Localities. Element 51. Retrieved July 9, 2007. ↑ The Institute of Archaeology, Chinese Academy of Social Sciences, Beijing. 2007. Ivory goblet inlaid with turquoise, Late Shang Period (c. 1200 B.C.E.) National Gallery of Art, Washington, D.C. Retrieved July 9, 2007. ↑ Navigating the Bible II, Exodus Chapter 28 World ORT. Retrieved July 9, 2007. ↑ Mindat.org. 2007. Turquoise. Mindat.org. Retrieved July 9, 2007. Turquoise. U.S. Department of the Interior, U.S. Geological Survey, Minerals Information. This page was last modified on 23 December 2015, at 22:43.